We all love a cheeky cooked breakfast from time to time, or maybe the fresh healthy option — either way Portsmouth & Southsea has a myriad of top locations to suit all appetites. From full-on gut busting cooked English breakfasts with all the trimmings to healthy granola, muesli, pastries and fresh juices; Portsmouth has it all on offer. Below is our definitive list to the best spots in the city to relax and get your fill before taking on the day. Look out for our ‘Locals Tips’ on specific eateries, and if you have a tip you want to share, get in touch. The Brewhouse & Kitchen, in the heart of Portsmouth, is a fantastic venue for real ales, freshly cooked meals and has a great relaxed/homely atmosphere. Owners, Brewhouse & Kitchen, have a strong ethos that is very much modelled from the history and pubs of old where independent pubs became known as free houses, and could buy their beer from any brewer. The team offer a wide range of freshly prepared and cooked foods on site, including cooked breakfast. From 10am, every day, Monday to Sunday serving delicious breakfast fayre, or just to kick-start your day with a cappuccino, croissant and the daily papers. Open throughout the year, Southsea Beach Café is the ideal place to enjoy everything from a tasty breakfast, lunchtime treat, or a relaxing dinner whilst you gaze out to the Solent from the café's unrivalled location on Southsea's beach. Southsea Beach Café offer an ever changing seasonal menu, stacked with fresh and locally sourced dishes that will leave you wanting more. The breakfast choice is excellent and includes full English, smashed avocado, eggs on toast, American Style Pancakes, and homemade Granola. Our recommendation is the café's renowned SBC Bubble 'n' Squeak Cake, topped with poached eggs and hollandaise sauce. Smile Café is a family run business right in the heart of Southsea. Specialising in home-cooked, healthy food, Smile Café are open Tuesday – Sunday 9am-4pm cooking up tasty breakfasts. On offer are fresh, home-cooked meals and the chefs at Smile also cater for vegetarian, vegan and customers with dietary requirements. Established in 2013, this independent coffee house has quickly established itself as a firm favourite amongst locals and the coffee fraternity. Serving fresh roasted espresso and hand poured filter, alongside loose-leaf tea and real hot chocolate. The coffeehouse also has a neat little breakfast menu, including chunky toast, granola yoghurt, tostada con tomate, muffins, or even cake. Look out for the café’s ‘snug’. A great place to hide away from the world and get lost in a great book. The french themed café is situated half way between the Commercial Road area and Gunwharf Quays complex. Serving Breakfasts from 8.00am Monday to Friday and from 9.00am on Saturdays, the café stays open until the early evening. Everything is prepared on the premises by a team of enthusiastic chefs. One of the best places to ‘people watch’ in Portsmouth. Renowned for their Irish Breakfast, including locally sourced sausage, black pudding, fried potato, fried eggs and more. The bar also serve up smaller options, and doorstep bacon or sausage sandwiches. This family run sandwich bar/cafe in the heart of Southsea’s unique Castle Road is a true hidden gem. The team offer a wide range of breakfasts and always do their upmost to accommodate all customer needs. Cooked breakfasts (tailored to your tastes), pastries, croissants and homemade sausage rolls are all on offer at Delaneys daily from 9am until 3pm. Mumms Cafe has been established in the city for many years. It’s a firm favourite amongst students looking for a recovery hangover cure, and locals hunting out value for money big breakfasts. The cafe is well-known for it’s large portions — that any cooked breakfast fan would struggle to polish off. A proper old greasy spoon. Boswell’s food products are freshly prepared on site each day, ensuring the freshest breakfasts. The cafe offer more than just a good cup of wake-up coffee. Pop in to try their freshly cooked english breakfasts, continental croissants or go healthy with their very own Boswells fruit salad. Voted as ‘community pub of the year’, this public house in the centre of Portsea Island is another hidden gem, and is much loved by breakfast hunting locals. The pub has a great selection and even has a create your own option for full control of your breakfast cravings. A buzzing little tearoom on Southsea Seafront, adjoined to a 9 hole golf course. 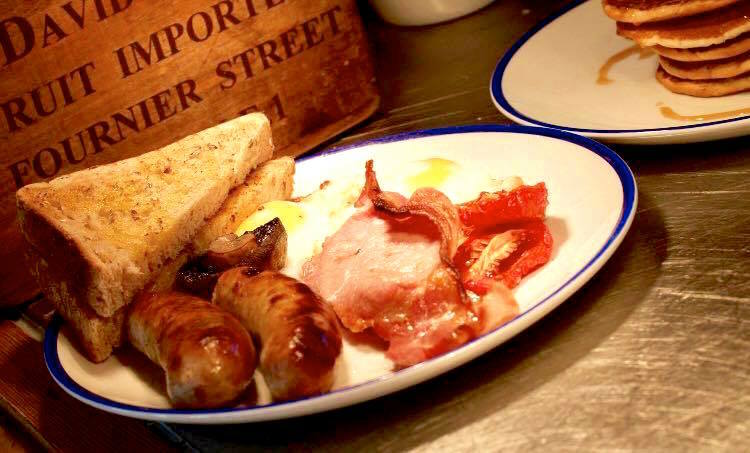 The team offer scrumptious, freshly cooked breakfasts served rom 8am to noon with a further extended menu of breakfast suitable meals available all day. Full english, vegetarian options and granola with berries & natural yoghurt, are all on the menu. Part of the Salvation Army’s projects in Southsea; The Lighthouse Community Café provides the local community with a place to relax and connect with each other. Breakfast available from 9 to 11:30am which includes cooked full english and lighter options. The world renowned skate park will be serving up full english delights from 10am – 12pm most days of the week. The resturant offers a stylish place to get together with friends or colleagues to relax and socialise and enjoy some fabulous food and drink — all with the fantastic vista of Portsmouth Harbour. Breakfast and brunch are on the menu until 12pm weekdays and 1pm weekends, with a great selection of breakfasts treats on offer. A firm favourite of the teams is the ‘Ever So Eggy Bread’ topped with crispy bacon and maple syrup. Coast to Coast offer their customers fabulous ingredients and say ‘nothing beats authentic American food.’ The original US memorabilia showcased on the walls, provides a genuine talking point telling stories of the towns and cities spanning the Lincoln Highway from East to West. Breakfast is served daily from 9am to midday, and the restaurant also offer 2 breakfasts for £10 everyday. This busy little café in Copnor, Portsmouth is a real gem, and is well loved by the locals of the area. Friendly staff are on hand offering good tea and coffee, all day breakfasts and all at reasonable prices.